Hanover, September 2017. General Tire has further optimised its range of winter tyres for cars, SUVs and vans in the Central European market. 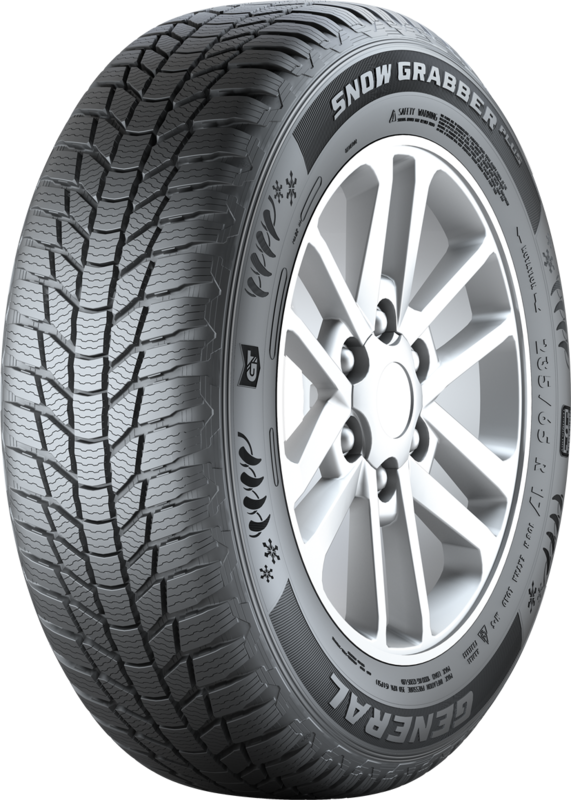 The latest additions to the winter tyre line-up are the Altimax Winter 3, Snow Grabber Plus, and Eurovan Winter 2. Rounding off the range is the new Eurovan A/S 365, an all-season tyre for vans and light commercial vehicles. All of these new products bear the Alpine symbol on the sidewall and meet the more rigorous legislation that now applies in Germany, where drivers are legally obliged to fit winter tyres in wintry weather. With its directional design and enhanced silica technology, the new Altimax Winter 3 provides safe and reliable winter mobility for compact to upper mid-range cars. The successor to the Altimax Winter Plus delivers enhanced performance in all of the key metrics. With an increase in the sipe density, multi-angled block edges and broad shoulder blocks, the Altimax Winter 3 offers a higher number of gripping edges in all directions of travel as well as greater block stiffness. This delivers additional traction, excellent handling on snow, and improved ride characteristics on dry roads - not to mention better transmission of braking and acceleration forces. The Altimax Winter 3 is produced in 41 sizes for 13 to 18 inch rims with aspect ratios between 80 and 40 percent, and is available in tyre widths from 155 to 245 millimeters which are approved for speeds of up to 240 km/h. This new non-studdable winter tyre for SUVs and 4x4 vehicles combines General Tire’s typical durability with the ride quality of a passenger car tyre and maximum mileage. Equipped with optimized block stiffness and a computer-optimized symmetrical tread design, the new arrival succeeds the non-studdable SnowGrabber. In the Snow Grabber Plus, General Tire brings its Tracgen technology to bear: Innovative snow ribs in the tread base combine with jagged tread blocks and an open shoulder design to ensure impressive traction on snow-covered tracks and loose surfaces as well as on snow-covered roads. This is complemented by shorter braking distances on snow and improved steering precision under extreme cornering on dry and wintry road surfaces. At the same time, General Tire’s Duragen technology ensures robustness: Reinforced tread blocks make for greater tread stability, while toothed sipes reduce block deformation, providing added protection against damage. An ultra-high-strength steel belt delivers dependable stability under all envisaged load conditions. The SnowGrabber Plus is produced in 25 sizes for 15 to 20 inch rims with aspect ratios between 75 and 40 percent, and is available in tyre widths from 205 to 275 millimeters which are approved for speeds of up to 240 km/h. With the Eurovan Winter 2, General Tire brings a worthy successor to the tried and tested Eurovan Winter to market. Its large number of sipes and the many different gripping edges in the blocks create an “ice scraper” effect. A combination of snow pockets and the optimised uptake of snow in the tread makes for enhanced snow-to-snow interlocking. Broad drainage channels ensure fast and efficient dispersion of water from the contact patch. As a result, the new Eurovan Winter 2 offers superior traction and top-class handling characteristics, as well as better braking on snow and wet roads. Other positives include its resistance to aquaplaning and good handling characteristics on slush. The compact shoulder blocks and two central, continuous tread ribs deliver safe grip when cornering and excellent directional stability. Like its predecessor, the new van and light commercial vehicle tyre is available for 14 to 16 inch rims in widths from 185 to 235 millimeters. Depending on size, these tyres are approved for speeds of up to 190 km/h. This all-season tyre from General Tire combines high performance on wet roads and very good braking performance on snow with excellent dynamic stability in all weather conditions. Its special features include the large number of gripping edges for optimal interlocking with snow, the zigzag sipes for safe grip on wet surfaces and the wide tread grooves for rapid water dispersion. Added to this, the high percentage of blocks in the tread delivers perfect steering precision and cornering stability. This all-season tyre is manufactured for 15 and 16 inch rims with aspect ratios from 75 to 60 percent and in widths between 195 and 235 millimeters. Depending on size, the Eurovan A/S 365 is approved for speeds of up to 210 km/h.